Validate the IBAN from 50 different countries. International Bank Account Number is a standard being adopted by most countries, specially in Europe. Checking an IBAN before making any fund transfer may avoid failed transactions while saving a lot of time. 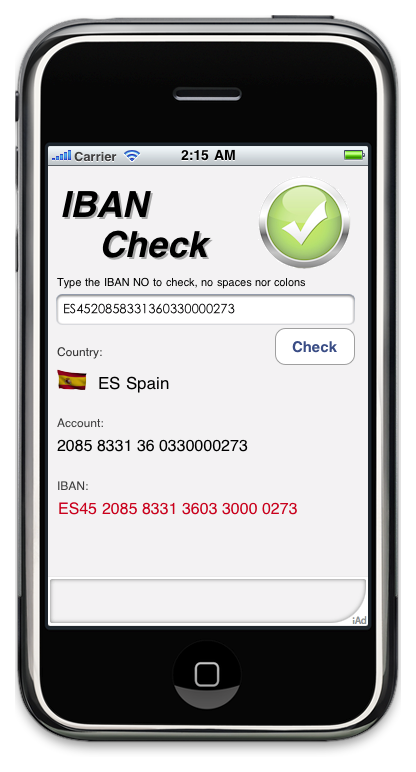 This app validates any IBAN and provides bank, branch and account numbers (if any). Shows the flag of the IBAN country. In HD for iPhone 4 owners. Although this validator has been fully checked, the results provided are for informational use only.